Fayose condemns Northern Youths ultimatum to Igbos to leave north – Royal Times of Nigeria. 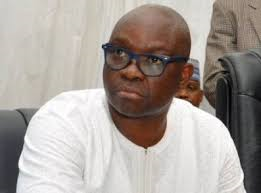 Ekiti State Governor, Mr Ayodele Fayose has condemned the ultimatum given by some Northern youths to the Igbos living in the North to leave the region. He said such reckless pronouncement could only come from a group of irresponsible and jobless youths. The governor chided the Northern youths for making such pronouncement at a time Nigerians needed to join hands together for the development of the nation and condemned the Northern elders who openly endorsed the action of the youths. He appealed to the Igbo people of the Southeast to remain calm even in the face of provocation, noting that Nigeria is greater than any set of people. He chided the All Progressives Congress (APC) led federal government on it’s inability to foster unity among Nigerians, citing the handling of the Fulani herdsmen menace as a pointer to the federal government’s non-chalant attitude to serious national issues bordering on the oneness of the country. He said; “I have said it times without number that Nigeria is now more divided than ever in the last two years. “The APC led administration has allowed this country to fall apart. Have you ever seen a country where the president will openly categorize its citizens’ access to government patronage into 97 percent of those who voted for him and five percent of those who didn’t? “It is for unguarded utterances and actions like these that our unity as a country is no longer like before”.